Below is Fanspeak’s final 7-Round Mock Draft for our 2014 NFL Draft Guide. The 2014 NFL Draft Guide will be available by this Wednesday for FREE! You can also get a 2014 NFL Draft Guide PREMIUM version by subscribing to On the Clock Premium HERE! The Premium Draft Guide Magazine includes more interviews, scouting reports, features and approximately 100 more pages of valuable content! Pre-order your PREMIUM Guide here and it will be directly emailed to you by Wednesday, as well as being able to enjoy the On the Clock Premium! NOTE: This full mock draft has descriptions for first 3 Rounds and does NOT have trades. A 3 Round Trade Mock Draft with descriptions is available in the Premium NFL Draft Guide! -This pick could go one of three ways: A top defensive player, a quarterback, or a trade back. With no trades in this scenario, it’s down to a quarterback versus a top defensive player. If the Texans believe that one of the top quarterbacks will become an elite talent, that is the direction they should go. But if they don’t feel confident in that regard, they have to take the best player on the board. Clowney is that best player on the board, and he has the athleticism to play a rush linebacker in the Texans scheme and make an instant impact in their system. -This may be a little high for Pryor, but the Rams have a real need here and could look to add the hard hitting Pryor with this selection. He should be an immediate starter in St. Louis and would give them a key piece in the secondary. -With the top two safeties off the board this pick will come down to either a defensive tackle or a corner. It could really go either way, but with Donald off the board and Gilbert still available, I believe the Bears would favor adding a potential shutdown corner. -The Ravens have a gaping hole at right tackle and could find an easy fix in Notre Dame’s Zack Martin, who also has the versatility to play inside if necessary. -The Jets have to add more playmakers and Odell Beckham fits the bill here. He would be a nice complement to Eric Decker who is more of a possession receiver. -The Dolphins have started the process of rebuilding their offensive line, but they are far from complete. Xavier Su’a-Filo could get a look at right tackle, but he will probably end up being a day 1 starting guard for them. -The Cardinals don’t have a pressing need here, which allows them to take their quarterback of the future here in Derek Carr. Though Bridgewater is an option, Carr seems like a better fit for the Cardinals. -The Packers defense has struggled these past few years as they haven’t had the true nose tackle eating up blockers that their defense demands. Nix can be that guy and his presence could make everyone else better. -The Eagles could go receiver here, but with it being such a deep position they could decide to wait until the 2nd round. Instead they land a good corner, capable of developing into a number 1 guy to match up versus some of the top receivers in the NFC East. -The Chiefs are desperate for a playmaker, and Cooks would give them just that. Hopefully the deep threat of Cooks would help open up things for Dwayne Bowe, who has struggled these past two seasons. -Dennard is a physical press corner and he could be a nice addition to the Bengals secondary. Cincinnati doesn’t have many needs, so they can nab the falling Dennard here and should hopefully get some considerable impact from this pick. -The Chargers could consider some various defensive players for this pick, but they could use additional help along their defensive line. Hageman is a good fit for the 3-4 scheme and he’s a guy who is just scratching the surface of his potential. -The Browns could go receiver here to give Johnny Manziel another weapon, but with Roby on the board, corner makes more sense with this pick. -This may be a slight reach, but pass rushers typically go higher than expected in the draft. The Saints defense needs to get better production from their rush linebackers and Attachou is a guy who should step in right away and upgrade their pass rush. -Though the Panthers are in need of receiver help, their offensive line is in shambles right now. The Panthers run game is the focal point of their offense, so adding offensive linemen is a must if they want to be able to move the football. Kouandjio has some serious health concerns, but if he checks out medically the Panthers will be happy to land him here with this pick. -The Patriots rebuilt their defensive secondary, but they haven’t done much to fix their defensive tackle need this offseason. Even if Vince Wilfork was 5 years younger and not coming off a serious injury, the Patriots would need to add some help to this group. With Wilfork’s status for this season and going forward a bit murky, this has become a serious need. -This probably wasn’t the direction the 49ers were planning on going a week or two ago, but with Aldon Smith’s latest off the field incident, San Francisco has to prepare for their future. Not only is Smith likely to be suspended for part of next season, but the team might not look to retain him beyond next year. -The Broncos could use some help at linebacker and C.J. Mosley is one of the best in this class. He can play inside at the middle spot, and also shift outside if they want to keep a 7 man front with Von Miller rushing the quarterback. -The Seahawks lost multiple defensive line pieces this offseason and they need to replace those losses if they don’t want to see their defense take a step back. Ealy has the size to be a versatile piece similar to Michael Bennett. -This is the dream scenario for the Texans as a month ago it was thought they would need to spend the first overall pick for Bridgewater and now he lands at their feet in the 2nd round. Bridgewater can be a really good quarterback at the next level and his slide could be Houston’s gain. -The Redskins will likely look to trade back to stockpile some picks, but if they stay here Moses makes a fair amount of sense. He should be ready to start at right tackle for them, which should help improve the run blocking for Alfred Morris and give RGIII some more protection in the pocket. -The Browns land their complementary receiver to Josh Gordon with this pick, and they should be pretty happy with Lee falling in their lap. -The Raiders get their young quarterback here in Garoppolo. He gets to sit for a year behind Matt Schaub, which could allow him to develop into a quality starting option down the road. -The Falcons need a lot of help on defense, but it will be tough to pass up a young tight end like Amaro to replace Tony Gonzalez. -The Buccaneers upgraded their pass rush in free agency, but they shouldn’t be done yet. Crichton gives them another guy who can get after the quarterback, and one that should offer pretty immediate impact. -The Jaguars need to upgrade their defense and Shazier could be an interesting fit for Gus Bradley. He could play outside and be asked to blitz quite a bit in their system. -The Vikings land their quarterback here in Mettenberger and he figures to be a good fit for offensive coordinator Norv Turner. -The Bills need help at right tackle and Bitonio looks capable of handling the position and starting early on. 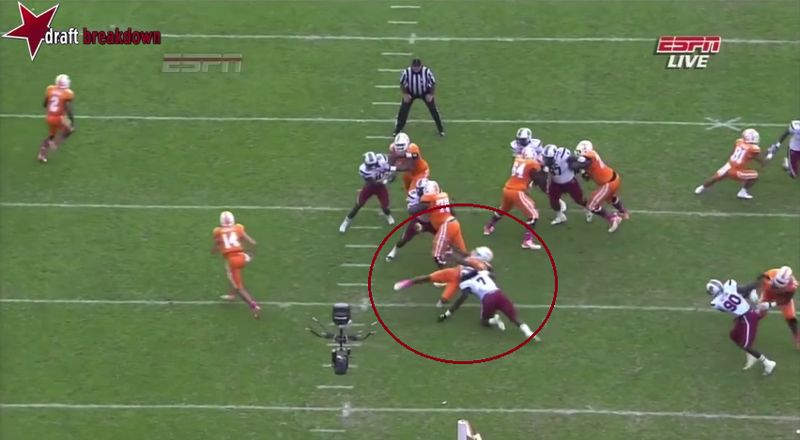 Bitonio also has the versatility to kick inside if necessary. -The Titans parted ways with Chris Johnson and could look to find his replacement early in the draft. Mason had a great end to his college career and looks to be a work horse back. -The Giants could go either offensive line or defense with this pick. Given how thin the safety position is at the top, grabbing Ward here makes sense for New York to help boost a secondary that struggled last year. -The Rams are still looking for that star receiver and they may take a shot at Benjamin to fill that role. Benjamin is a raw talent, but if he can put it all together he could be a star. -The Lions need corner help and adding Verrett is a no brainer at this selection. He can play in the slot, but also has the talent to play outside as well. -The Steelers could use some size and help at wide receiver and local product Allen Robinson fits both of those criteria. Robinson could be a nice complement to Antonio Brown, and would give the Steelers a nice receiver corps. -The Cowboys went defensive end in the first so look for them to add a defensive tackle in either the 2nd or the 3rd. With Easley on the board that should be the direction that they go as he’s a perfect fit for their Tampa Two defense. -This isn’t a major need for 2014, but the Ravens could look to add a long term receiving complement to Torrey Smith. Adams has a nice combination of size and speed and if given a year or two to develop he could end up being a really nice starter down the road. -The Jets need to add more weapons than just one receiver to boost their offense, and it would make a lot of sense for them to come back in the 2nd round with Seferian-Jenkins if he’s available. -The Dolphins need to fix their line so look for a major investment into the unit. Using their top two picks on the position group makes a lot of sense. -The Bears need to add a defensive tackle at this spot and Sutton is a guy who could be a nice fit. Sutton could thrive in the Bears system as a quality pass rushing defensive tackle. -For as good as the Cardinals defense has been in recent years, they really haven’t had strong pass rushing outside linebackers. Adding Lawrence could help fix that, and that could turn a strong defense into a great one. -The Packers need secondary help and could look at the hybrid corner/safety LaMarcus Joyner to fill their need. Green Bay will probably see him as more of a safety, but he could get consideration at corner as well. 22 (54). Philadelphia Eagles: WR Jordan Matthews, Vanderbilt-The Eagles seem to want to add another big receiver, and would be lucky to land Jordan Matthews here. Matthews is one of the most NFL ready receivers in this draft and could help the Eagles fill the gap left by DeSean Jackson. -The Bengals don’t have many pressing needs, so look for them to take a value pick here. They might have spent a 2nd on RB the year before, but Bernard isn’t an every-down back. He needs a power complement and that is where Hyde comes in. He can be the chain-mover, short yardage back, while Bernard comes in for the big play. -The 49ers could go any number of directions, but the idea of adding Tuitt to their defensive line rotation is too good to pass up. -The Chargers could use more help along their offensive line and grabbing Gabe Jackson should give them a guy who can start right away. -Phillip Gaines is climbing up draft boards and he could make a lot of sense to the Saints with this pick. He’s a talent corner who was overlooked at a smaller school. -The Colts could possibly consider an offensive or defensive lineman with this pick, but I think this selection is about adding a piece to their secondary for a possible Patriots or Broncos match-up in the post season. -The Panthers land their receiver with this pick and give Newton an interesting prospect with a nice combination of size and speed. -The 49ers are bound to be intrigued by the versatile Jones, who can line up in a variety of spots. He could help replace Bowman if he’s not back from injury and he has the pass rush ability to help replace Aldon Smith during his inevitable suspension. -The Patriots need to upgrade their tight end position and grabbing an inline tight end option like Niklas makes a lot of sense. If Gronkowski is healthy he could be split out wide more in two tight end sets, or the Patriots could use both on the line giving them a favorable formation to run from. -The Broncos did sign DeMarcus Ware, but they can’t be content that their defensive line is set at this point. Adding another talented piece in Martin would help ensure the Broncos have the depth and talent to make another Super Bowl run. -The Seahawks need help at guard and could look to David Yankey to fill their need there. -The Texans could use help at right tackle and Fleming is a guy who could start right away. -Both of the Redskins starting safeties are signed to 1 year deals, so help is very much needed at this position. Buchanon could push for a starting job this year and has the potential to develop into a very good starter. -The Raiders added some nice free agent help to their defensive line this offseason, but all those players are on short term deals. Murphy would give the Raiders a quality defensive end for the future. -The Falcons continue to bolster their defense here and land another nice player in OLB Carl Bradford. -The Buccaneers could double up on Clemson receivers in this draft. Watkins is obviously the star, but Bryant has a lot of upside as well. He’s a big more raw, but he could be a nice developmental 3rd receiver for the Bucs. -The Jaguars would likely use Reilly in their Leo position where they like to generate a lot of their pass rush. -Ben Tate was a nice free agent pick-up, but the Browns need to have a 2nd piece here. Carey is a nice option and has some potential of becoming a feature back himself. -The Vikings could use some additional corner help and they could look to the high upside Jean Baptiste as an option. -The Bills need further help in the secondary and could look at Breeland given his size and potential. -The Giants pass rush situation isn’t as strong as it once was and they could look to add a guy in the early part of the draft. -The Rams have great defensive ends, but they could use some additional help at defensive tackle. Ferguson would probably be just a rotational guy to start, but he could team up with former LSU Tiger Michael Brockers down the road. -The Lions need to find a center for the future and Richburg is considered one of the top centers in this draft. -The 49ers need to find some help at center if Daniel Kilgore isn’t up to the task for the starting role. -The Cowboys continue to upgrade their defense through this draft. -The Ravens need to start thinking about their future at running back. West is a local product who has a lot of potential. -The Jets need some help at guard and Dozier is a high upside option who may be able to push for a starting job. -The Dolphins need help at running back and they can’t rely on their current guys to be the answer this year. Hill has the potential to develop into a feature back down the road. -While Sutton was more of the 3 tech, pass rushing DT, Jones can be the run stuffer who occupies blockers. -The Browns could see Turner as a guy who could challenge for the right tackle spot now, and possible replace Joe Thomas in the future if necessary. -The Cardinals could use help at inside linebacker, and Chris Borland is a guy who could push for a starting role as a rookie. -Receiver isn’t a pressing need for the Packers, but they are a team that typically looks to the future in this regard, and Cobb is entering his final year under his rookie contract. -The Eagles could use more pass rushing help and should look to add an option in this range. -The Chiefs need help in the defensive backfield and considering they need to play Peyton Manning twice and Philip Rivers twice, this is not a position they can go cheap on. -The Bengals have likely found their number two receiver in Marvin Jones, but they could use a reliable third option. -Ryan Mathews had a good year last year, but teams need two running backs, and Woodhead is only a utility player. Williams could be a good back-up running back to Mathews. -McGill could fit in either as a corner or a safety and with the Colts looking to add talent to their secondary. -The Saints added Jarius Byrd, but they could use some safety depth. Bailey obviously won’t start, but he could get some work in certain sets and help on special teams. -The Panthers need to keep adding to their offensive line. Mewhort could be an option for RT or even inside at guard. -One of the biggest draft risers is Pitt QB Tom Savage. He’s got great size and could be a fit in New England since he could have a couple of years to develop. -Frank Gore is getting up there in age so some help is needed here. Sankey could be the back-up for a year or two and then take over the starting role. -The Broncos keep adding help on defense here and add a really intriguing piece in the small school Desir. He’s got great size and potential, and could develop nicely in this secondary. -The Vikings could use some further receiver help and Latimer is a guy who is starting to climb draft boards. -The Steelers could use a true nose tackle and Ellis is one of the best in the class. -The Packers re-signed Matt Flynn, but they can’t feel confident about the long term future behind Aaron Rodgers. McCarron could be a nice back-up option for the next couple of years. -Smith is a tweener who could help at either linebacker or safety. In the end he will probably play a hybrid role and help on special teams. -The 49ers need some help at receiver and Landry is a nice pick-up here. He could go higher, but he didn’t have the best workout and it’s such a deep receiver class.